Can I use my app to control when the Hub is on or off? Once your Hub is set up on WiFi, you can remotely change your Hub's settings even if you aren't at home! Even if you hare home, many people find it easier to turn the Hub on and off using their phone, rather than unplugging it and plugging it back in each time. To turn the Hub on and off, go to the settings menu in your app, marked with a red arrow in the screenshots below. Here you have the option for the Hub to stay on, stay off, or use the automatic scheduler. In this section of the settings menu you can also find the automatic scheduler. You can use this function to start and stop the Hub at times chosen ahead of time. For example, you could set the Hub to only be on while you're at work, or even to only stay on for an hour. You can also select a different schedule for the weekend. After you change the schedule, it may take a few minutes for the change to take effect. 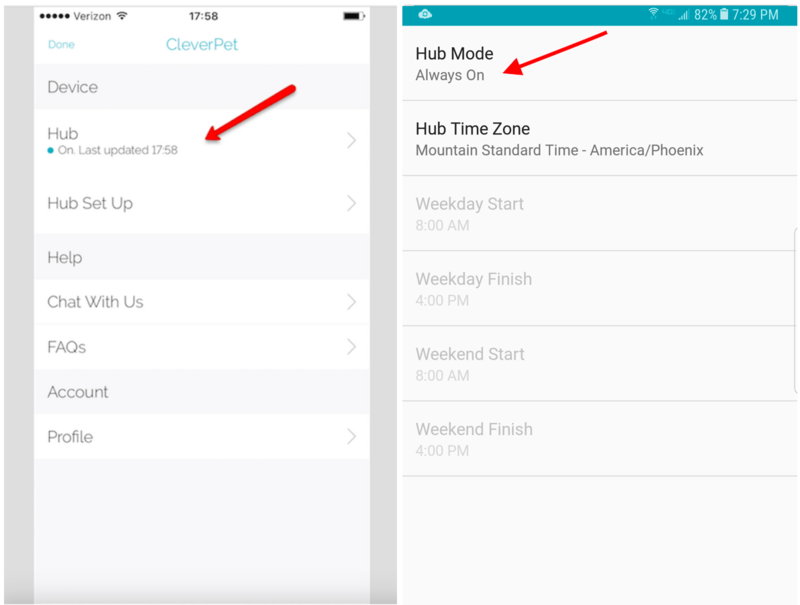 You can also set the Hub to turn off after your dog has eaten a certain amount of food, rather than after a time interval. Learn more about this feature here.